a bundle of new enterprise-class features in Google Analytics. Over the next few weeks, we'll do posts which go into depth on each new feature. 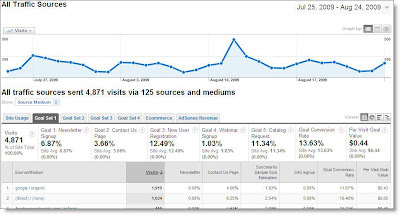 Here is the first, which goes into detail on the expanded and improved goals in Google Analytics (related video). It's very clearly and insightfully written by our friends at WebShare, a Google Analytics Authorized Consultant, with links to related help center articles. You can probably think of more than four things you'd like your visitors to be doing when they visit your website. 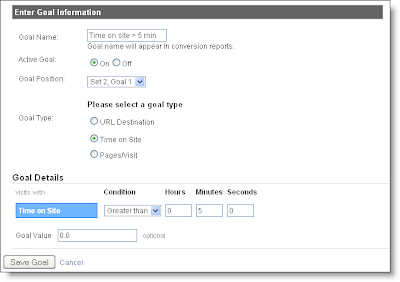 Until last week, Google Analytics had limited the number of configurable goals per profile to just four. Sure, you can create 50 profiles and thus track up to 200 goals, but having to switch back and forth in your reports can be a bit cumbersome. Well, here's some very welcome news: comprehensive site performance measurement just got easier. 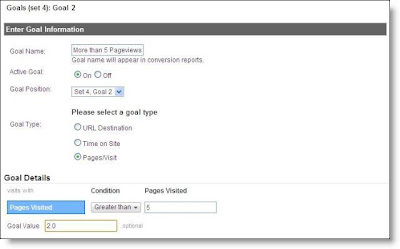 A newly released feature in Google Analytics now lets you create up to 20 conversion goals per profile, including new Engagement goals. In the screenshot above, you can see that Goal Set 1 is comprised of five individual goals. Look in the white boxes under "Goal Set 1" and you'll see "Goal 1: Newsletter Signup", "Goal 2: Contact Us Page", "Goal 3: New User Registration", "Goal 4: Webinar Signup" and "Goal 5: Catalog Request". Goal Sets 2, 3, 4 contain various other goals, and a simple click on the tab puts the numbers you need right at your fingertips. Goal configuration has a new look which follows the goal set organization. For each goal set, you can add up to five individual goals (the remaining number of goals in each set are conveniently noted for you). To add a new goal, just click on the “Add goal” link for the goal set you wish to add a goal to. Another change you'll notice is the addition of two new goal types called Engagement goals: Time on Site and Pages/Visit. Previously goals could only be counted when a particular page URL was visited, but Engagement goals will allow a conversion to be recorded when a visitor reaches a certain threshold of involvement with your site. For instance, do you have an ad-serving site and want to record a conversion when a visitor has seen 10 pages? Now you can. Or, are you serving up audio/video or longer content pieces and want get an idea of how long people are listening, viewing or reading? A Time on Site goal can help. As always, if you'd like a monetary value to be assigned to any of your goals and used in cost and revenue calculations, just enter the amount in the "Goal Value" field. One more change to the goal creation page is the goal funnel creation step. The setup is collapsed by default (as it is optional), but if your URL Destination goals follow a path and you'd like to see how users are entering, following and abandoning that path, this is something that you can take advantage of. To create a funnel, just click on the “+ Yes, create a funnel for this goal” link and start entering the URL path to your goal, adding up to 10 steps. 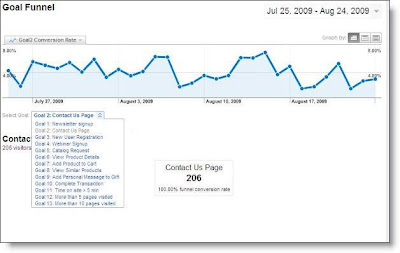 With this new addition to Google Analytics, opportunities to understand and then cater to your visitors abound. So the question is, how will you take advantage of this for your site? Last week, we announced a bundle of new enterprise-class features in Google Analytics. Over the next few weeks, we'll do posts which go into depth on each new feature. 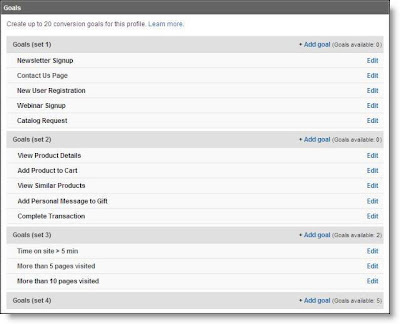 Here is the first, which goes into detail on the expanded and improved goals in Google Analytics (related video). It's very clearly and insightfully written by our friends at WebShare, a Google Analytics Authorized Consultant, with links to related help center articles.